AAV-1 Bicistronic Expression System (IRES-Hygro) | Cell Biolabs, Inc. Figure 1: Production and Transduction of AAV2-GFP. AAV2-GFP was produced by cotransfection of 293AAV cells (Catalog #AAV-100) with pAAV-GFP, pAAV-RC2, and pHelper plasmids. 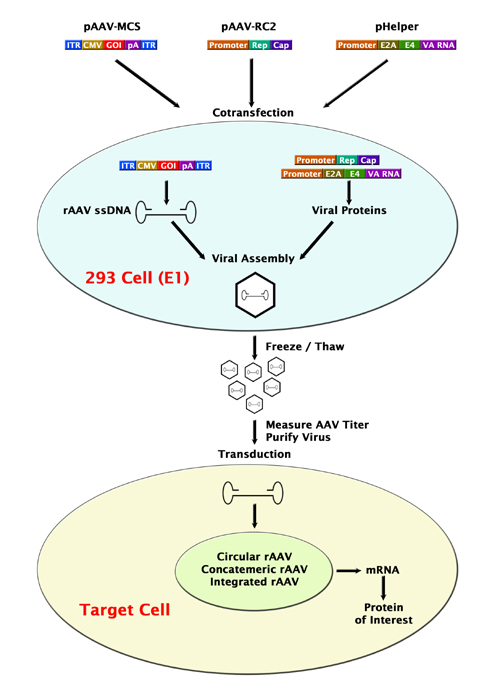 Upon harvesting viral supernatant, 293AD cells (Catalog #AD-100) were infected with AAV2-GFP for 48 hours.